DROP THE STOP LEAK & BACK AWAY!! My blogs are usually written just after I see or experience something that makes me go “Dude….Seriously?” Recently a customer came in because their truck was running hot in traffic. Makes sense that after checking the fans are working etc, no major leaks, but no flow through the radiator, that we needed to replace the radiator. After taking out the radiator we found something that makes mechanics shake their heads in disbelief. 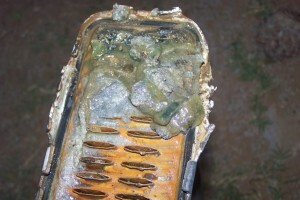 The entire system was junked up with sludge caused by the use of “stop leak”. As many of you know you can purchase this stuff at parts stores, who advertise it as a remedy for leaking radiators, head gaskets, heater cores, and so on. Sure, instead of fixing a leaking gasket, this $18 can of stop leak will solve your problems. Naw man. I guess to explain why this can cause more issues such as clogging all those parts it says it fixes, is to basically explain how the stuff works. It will go through the entire cooling system highway and start building up (coagulating) in places where there is a leak and also places where there are no leaks. Just like blood does in our body. You skin you knee, blood “leaks” but then the blood’s platelets thicken the blood and the blood dries making a hardened surface, i.e. fixing the leak. Now imagine if the blood did the same thing internally throughout your entire cardiovascular system. You’d have more strokes than (insert golf humor here). Anyway, it works. The stuff can often times stop a leak. Im not saying it does not. It’s the collateral damage that will come back to bite you later. If you put it in your car to stop a radiator leak, the leak may stop. Then the radiator gets clogged and you have to replace it anyway. Then the heater core needs to be replaced because its clogged, then the water pump, and so on. This entry was posted on Thursday, June 26th, 2014 at 4:05 am	and is filed under Helpful Tips. You can follow any responses to this entry through the RSS 2.0 feed. Responses are currently closed, but you can trackback from your own site.